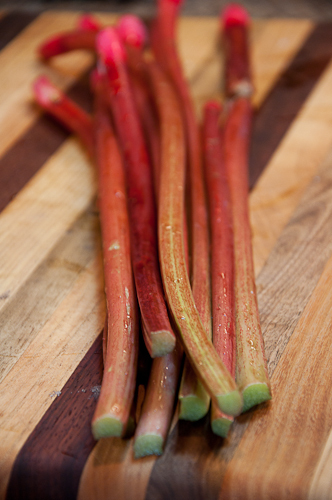 My friend Kelly has a huge rhubarb plant in her backyard that in the spring flourishes with beautiful red stalks. I showed up at her house on the perfect weekend for picking. She was kind enough to chop off several stalks for me to take home. The funny things is I hadn't eaten a lot of rhubarb in my lifetime unless it has been hidden in pies. I am looking forward to this fun experiment. Look how beautiful it looks. 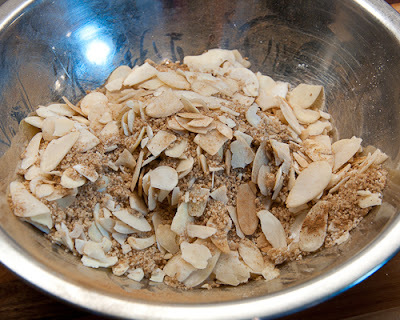 1) Make the streusel: Combine almonds, sugar and cinnamon in a small bowl and set aside. 2) Preheat the oven to 350F. 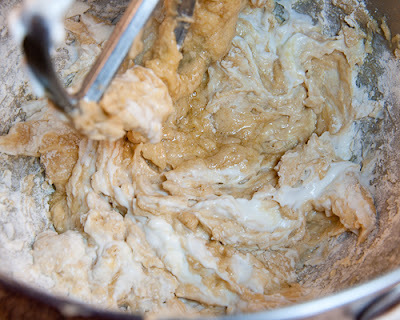 In a mixer bowl or large bowl combine the butter and sugar and beat until fluffy. Beat in eggs, one at a time with vanilla. 3) In another bowl combine dry ingredients. Add dry mixture and yogurt, alternating, splitting the dry ingredients into 3 additions, yogurt into 2. Fold in half the fruit. 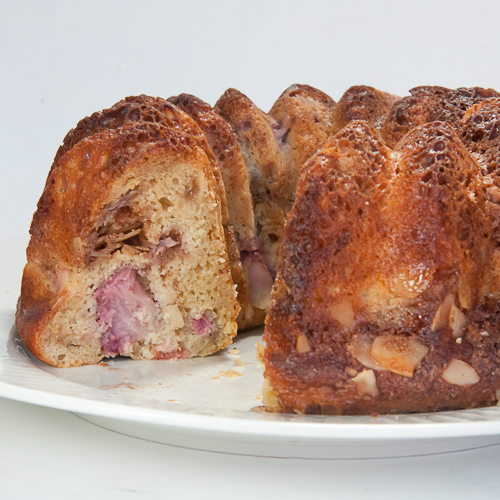 4) Spray a bundt pan with non stick spray. 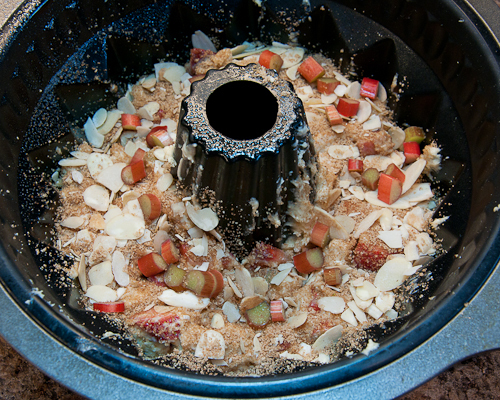 Add 1/3 the mixture into the pan and then add the remaining fruit and streusel mixture. Add the remaining batter on top. 5) Bake for 35 min until a wooden skewer comes out clean. Let cool on rack for 5 minutes and remove from pan. Wrap with saran wrap to keep fresh. I don't know why but I love fruit bread and cakes. This cake was moist, fresh and perfectly sweet. My first attempt at a rhubarb dessert and I am happy. Thanks Kel for the rhubarb. I still have some left in the freezer to bake you something. What a GORGEOUS looking cake! I haven't gotten my hands on any rhubarb this year (yet!) but I can't wait. Might just have to try this recipe.